Refugees are authorized to work in the United States, but the obstacles they face while looking for employment are enormous, especially without their personal and professional networks. Although many employers are sympathetic to the cause, they don’t have resources to invest in vetting job applicants sent from resettlement agencies. Volunteer groups—often established within faith-based organizations—have sprung up to help, but they lack efficient systems to manage information and relationships, making their important work more time-consuming and frustrating than it needs to be. Prospect is a digital service that enables volunteer organizations to more effectively leverage their networks and experience to help resettled refugees find jobs and restore their independence. Giving volunteers one place to store jobseekers’ information and keep track of employment opportunities, allows them to focus on building meaningful bonds with refugees and connect them with the jobs they want and can excel at. For my master’s thesis, I created Prospect working with a group of volunteers actively helping refugees in the New York Metro Area find jobs. I presented Prospect to the public at STATE / CHANGE, the 2018 MFA Interaction Design Thesis Festival at SVA Theatre. The dashboard is a place for time-sensitive information. Volunteers can see and post news and announcements here, like the date of their next meeting or an upcoming job fair. It’s a place for victories, too—like a refugee getting a job or a raise. The dashboard is also where volunteers can find the intake questionnaire. The questionnaire guides the initial in-person meeting with a refugee and includes an Advisor Reflection at the end, designed to give volunteers a few minutes to debrief after the meeting while it’s still fresh in their minds. In the Jobseekers section, volunteers see only the most pertinent information to helping refugees find jobs. This includes their English skill level and the professional summary that appears at the top of their resume. Volunteers can view jobseekers in a list or as cards. Jobseekers' records are organized in the same way as the printed questionnaire, to make inputting critical information easier. The Recent Activity section allows volunteers to record any significant communication with jobseekers. All documents are stored in an integrated Google Drive, but volunteers don’t have to navigate there to access what they need. All volunteers will have edit rights to resumes so they can help each other with revisions. Refugees will have access via the link from Google Docs, but not through Prospect, which remains volunteer-facing only. The Employers section can also be viewed as a list or as cards. Status indicators highlight the companies with open opportunities, or those that may only be leads. Clicking on a company that has jobs available reveals information about open positions. There’s a place for Recent Activity here too, for any notes from conversations with employers. United by a cause, volunteers aren’t necessarily familiar with each other. The Advisors section is where they can summarize their professional experience, so that others can take advantage of their networks. Displaying their contact information also makes it easier to get help when they need it, and stop working in silos. The Resources section is where volunteers can share materials they’ve found helpful as they navigate refugee employment. My exploration into improving the refugee resettlement process began in the summer of 2017. I spent six weeks in Lebanon with a classmate to conduct a self-directed research project on legal work and residency opportunities for Syrian refugees. In interviews with refugees, locals, NGO staff, and UNHCR officials, we learned about the difficult circumstances of helping refugees in Lebanon, but also of the many existing efforts on the ground. In the fall, I connected with a Syrian refugee named Ghaith, who was resettled to Italy from Lebanon by an NGO called Mediterranean Hope. Mediterranean Hope is a project supported by a federation of Italian churches, which has resettled more than a thousand Syrians in the past two years across Italy. Interviews with Ghaith and Mediterranean Hope staff revealed a gap in the services provided to refugees: the need to connect them with work opportunities once resettled. At the same time, I was learning about the resettlement process in the United States, and meeting with people working to help refugees locally. I learned that when refugees arrive in the United States, they get a small amount of support from the government, but it often only lasts a few months. Refugees need jobs, but they face huge obstacles that impede their success. They include learning a new language and culture, finding childcare, figuring out transportation, and completely rebuilding their personal and professional networks. This is made even harder for those who are coping with trauma from their past. Resettlement agencies are tasked with helping refugees regain self-sufficiency, but many are under-resourced and understaffed. I had a pivotal meeting with members of the Rutgers Presbyterian Church’s Refugee Task Force, a group of volunteers who at the time, had led the co-sponsorship of two Syrian refugee families resettled to New Jersey. The second family they helped to resettle arrived right after the Trump administration’s executive travel ban. I was then introduced to a volunteer group established by a member of the B’nai Jeshurun Synagogue on the Upper West Side. Now a mix of synagogue members and nonmembers, they help refugees find jobs by leveraging their own networks and experience. From attending their monthly meeting, and interviewing 8 volunteers, I learned about the group’s goals and challenges. At each meeting, packets of paper get shuffled around, as they talk about the companies they're in touch with, who's been hired recently, and the new jobseekers they'll help. Beyond these meetings, they spend hours with refugees, helping them to craft resumes and prepare for interviews. But like other ad hoc volunteer groups, they never had the time to put the right systems into place to operate optimally. This lack of infrastructure leads to communication gaps and misinformation, wasting time for refugees, employers, and volunteers, or even missed opportunities to match refugees with jobs that could help them get their lives back on track. I started by creating a low-fidelity journey map using stickies, highlighting the touch points and questions I had. Then I used the 5 Es framework to capture the needs of volunteers and jobseekers and identify opportunities for improvement. Turning the questionnaire into a Google Form was the best way for me to know how to organize the questions, and get a feel for how many questions belonged on each page. I also saw potential in it being a stepping stone solution as we worked toward something more robust. I made quick sketches on paper before moving onto digital wireframes. The initial wireframes illustrated a custom CRM that could be the central system where documents are stored and communication is recorded. Some challenges included figuring out the right language for aspects of the design such as the evaluating jobseekers' language levels, and differentiating between immigration status and job-seeking status. Next, I created my first working prototype, using Sketch and InVision. Before getting started, I examined CRMs on the market to learn about best practices, and also the challenges nonprofits and volunteers face when setting these up themselves. I decided to create prototypes of a desktop site as well as a mobile app, since from research, I learned that an obstacle is uploading photos of jobseekers and their documents, from their phones to their computers. I created a discussion guide, (modeled after the NYC Service Design Studio’s guide) to conduct user testing with members of the volunteer group. In addition to gaining valuable insights on how to iterate on the product, I also sought design critique and advice from my classmates. After a major round of iteration, I tested the new version with more volunteers before working on the final design. Some new features they tested during this round included the list view and card view, the addition of the Advisors section, and categorizing resources with tags. It’s important to learn about everyone’s pain points within a complex system, even when only targeting one audience type. In this case, I learned that resettlement organizations need volunteers to report the number of hours they spend with refugees in order to justify government funding requests. 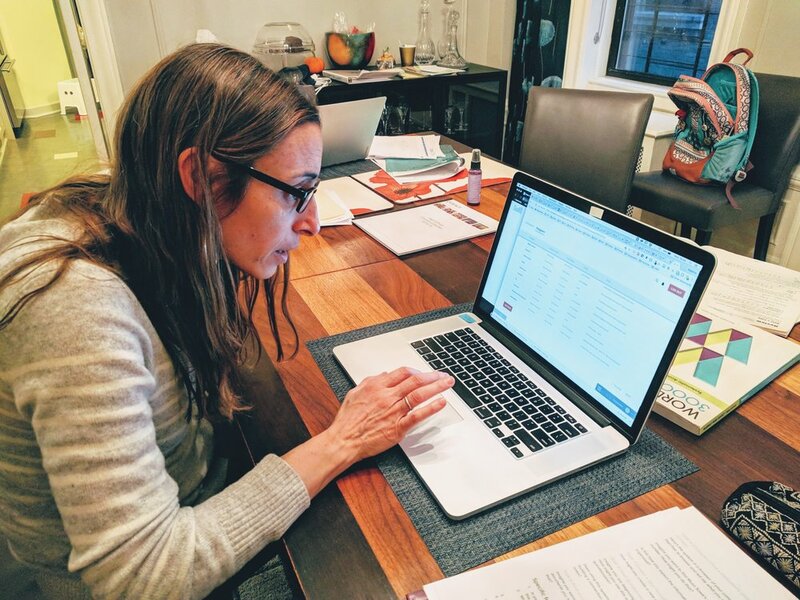 Alleviating the burden of filling out a timesheet by incorporating it into Prospect makes it effortless for volunteers, but helps more refugees in the long run. Prototyping early helps to narrow down to the MVP faster. When I prototyped both the mobile app and desktop experiences, I learned from users that the robust desktop system is what they really needed, and the mobile app would be a nice-to-have. Learning stakeholders’ goals early on determines the scope of a project and feasibility of deployment. I focused on meeting with volunteers first, and didn’t meet with the chairperson of the group until close to the end of my thesis work. Although he saw potential in Prospect being helpful to volunteers, his priority is alleviating the burden for employers to hire refugees. If I were to do things differently, I would have met with him sooner, to understand what features would make Prospect an immediate necessity to him. As part of our Master’s Thesis Festival, STATE / CHANGE, I exhibited my prototype at SVA’s Gramercy Gallery. I used the space to tell the story of one refugee’s journey, escaping persecution in his home country to restarting his life in the United States. I hope being able to show how long it took for him to not only find a job, but to gain asylum inspired visitors to hire refugees and support much needed reform to our country’s resettlement policies.